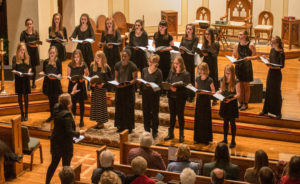 Bella Voce is an ensemble designed for those interested in performing at a higher musical level. Healthy and expressive singing habits are fostered in this choir, and the literature is selected to support the creative and developing minds of the adolescent female. Emphasis is placed on creating an atmosphere that is positive, supportive, and empowering for young women. In addition to several concerts per year, singers may participate in retreats, special rehearsals, dress rehearsals, and an outreach performance. Singers are promoted from Choristers or are placed in Bella Voce following a required placement voicing. Bella Voce meets August 26-December 2 and February 3-May 5.